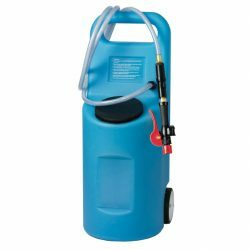 The 10 Gallon AC-Powered Watering Cart (WC-HYDRO-10-KIT) is ideal for watering industrial forklift batteries in small to mid-size operations. The 13’ (3.96 m) power cord plugs into any 110 V ac outlet to supply power to the unit. The 12’ (3.66 m) output hose and water gun are used to provide water to battery cells. The combined length of the power cord and the output hose extend the service range for battery maintenance.